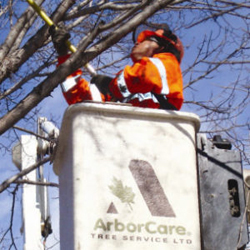 ArborCare Tree Service offers Winter Plant Protection to clients across Western Canada, including in Calgary, Edmonton, Kelowna & Vernon. We recommend the final application of the ArborCare Plant Management (APM) program during the winter. Our weather often fluctuates and we experience warmer than average winters or sudden, sharp drops in temperature, and this can cause dieback and can be extremely injurious to many kinds of trees and shrubs the following spring. Winter protection sprays can be applied to evergreens whenever possible. These anti-desiccants coat needles and leaves with an invisible, waxy substance preventing loss of vital moisture. Other protections for sensitive or new plantings include temporary snow fences, burlap or any other physical barrier to guard against the force of drying winds. Refer to our Plant Problems page for more information, or contact us directly with your questions.